Boots mini club today launches an exciting collaboration – with uber cool UK mum, Fearne Cotton. As you’d expect, FEARNE by Fearne Cotton is full of fashion clout and cool. The collection of 31 pieces (25 at launch with a further 6 options in October) is based on items that Fearne herself loves, such as faux fur coats, bombers and low slung trousers. 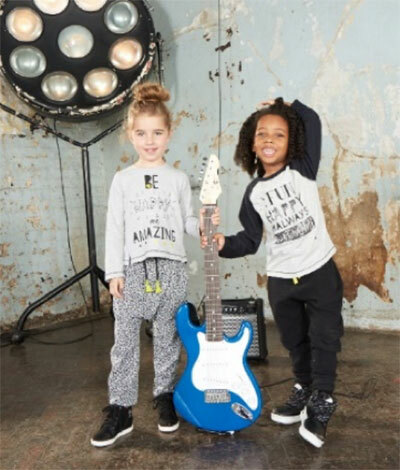 With items for kids aged 9 months, to six years and from just £7, the collection oozes Fearne’s relaxed rock-chic style. But, as a mum of two, Fearne is all too familiar with the need for practical style too. She’s therefore worked closely with the team to create garments that, as with all mini club clothes, are easy to put on (and easy to whip off), easy to wash and long lasting. This is the first time mini club has collaborated with a celebrity. Explaining the partnership is Head of mini club, Margaret Kirkpatrick, “We have all long admired Fearne’s gorgeous style, but we also admire her approach to being a mum. She puts such fun, joy and energy into everything she does. That’s what we try to do with the mini club brand – we aim to create clothes that allow kids to enjoy being kids: to have fun, to be comfy and to look gorgeous. “The mini club team have really enjoyed working with Fearne, and we are delighted to have had the opportunity to collaborate on such an exciting partnership”. Launching in selected Boots stores and online on 30th August FEARNE by Fearne Cotton will help your little ones look and feel great this Autumn.